There is a chance that your vacation might involve rain. Some people bring a great umbrella with them and go on about their itinerary, while others face difficulties staying entertained in the rain. 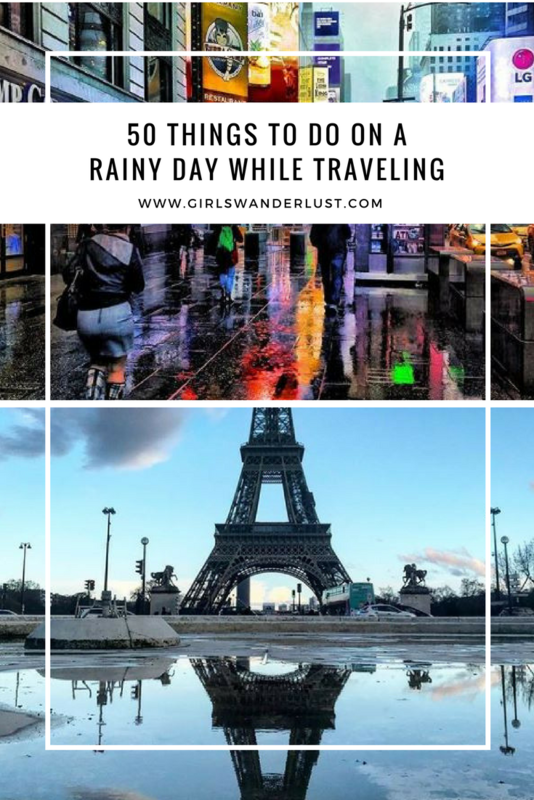 This post includes 50 activities you can do on a rainy day while travelling. Ever wondered what an epic hotel room party or hostel party was like? Why not throw one yourself! Research the top 10 local delicacies and try at least one of them! Build a fort in your 4-bunk bed dorm room or organize a dance party in the shared kitchen. Postcards are amazing and everybody likes them! Send some post cards about your travel experience. Delete old photos, organize your contacts, delete some applications, just take your time to organize your phone. Exercise your brain with some puzzles. Stayed somewhere good? Eaten a great dish? Share your experience online. Places you still like to visit? Dishes you still like to try? Write a bucket list. You can find my bucket list with 150 things to do before I die here. You can also write a bucket list regarding a specific subject like a things you still want to do in a certain town or a food bucket list. From travel tips to personal stories and life journeys to anecdotes and recipes, the internet is filled with brilliant blogs to follow. A rainy day is a great day to do some meditation. Music is always nice to hear! Just lay down at your bed or catch up with some friends, and listen to some tunes. You can go outside and look for some live music! Go to a game hall to play some arcade games or play a game in the ho(s)tel. Place some of your photos on your Instagram account. You’ll find us on Instagram here. Take a nap, but don´t forget to set your alarm. Use your time to learn some of the local language. A good application on your phone to do so is ´Duolingo´. Get together with some people, learn about other international kitchens, or cook your own favorite dish for them. Those people hanging around in the common area or waiting room are probably bored too. Strike up a conversation and perhaps you make new friends. I always write down my travel experiences. A rainy day is a good moment to write a little. Drawing is good for your brain and can be much fun! If you’re staying in a hostel, you won’t have to search hard to find some sort of musical instrument. Try to learn some tunes! I always have some messages that I forget to answer. Open your messenger and start that conversation that you were planning on a long time ago. Being stuck inside is a great time to organize your luggage! Read our 20 useful tips for packing your backpack! Have some (travel) competitions with your friends. Always fun idea, but make sure to drink responsibly! Find an inside place where you can follow a yoga class or when you are already familiar with yoga, you can do it in your ho(s)tel. Sort your photos! Delete the blurry ones, organize them into albums, and create a slideshow for your friends and family. One of the dullest things to do while travelling; doing your laundry. However, doing this on a rainy day is a win-win situation, because you can’t go outside anyway. When you really have nothing to do, it might be fun to watch some movies or documentaries. You can find the 60 best travel movies ever in this post! Use the time hiding inside, to call some of your beloved ones. Call your mum, dad, grandma, or one of your great friends! Instead of running away from the rain, walk out into it. Grab an umbrella and continue your travel itinerary. Go watch a movie at the local cinema or at a bar that organizes a movie marathon or movie night. Museums always get busier on rainy days, but you can avoid that long line at the ticket counter by buying tickets online before you go. Gather with friends and organize a pubcrawl! Remember to drink responsible. I love to stroll around libraries on rainy days. Go visit a library or bookstore, hide in a cozy corner, and do some reading. Check out my list of the 44 best travel books of all time. Are you a coffee lover or a pie lover? Go find the little local coffee shops and enjoy a cake, coffee, or cup of tea. Go visit local craft shops, clothing stores, or local supermarkets, and do some shopping. Visiting a spa is also a great idea on a rainy day. Try a massage, manicure, pedicure, sauna, or typical bathhouse experience. Go outside and make some amazing photographs. Rainy days can offer some very interesting shots. Look for reflections in puddles. You can still have the holiday feel of warm water by finding a covered or heated swimming pool. A good moment to explore underground tourist attractions, is when it is raining. Think about mines or caves. Find a daytime ‘night’ club. At certain cities, you can find a nightclub at any time of the day. Learn more about the handicrafts or local food from the place you are visiting. Go visit the local cheese factory, chocolate bar, wood carver, or Jewelry factory. Try the fitness room of your hotel or go for a run outside. Running in the rain is very refreshing. Get stuck in a restaurant and enjoy some good food. When staying at a local homestay or AirBnB accommodation, you are more likely to get into contact with a local. See how locals tackle rainy days or cook together some authentic dishes. Regardless of whether you’re religious or not, the local religious building can provide refuge from the rain and most of these structures are usually impressive. Keep the local customs in mind while visiting. If there is a hop on hop off city sightseeing bus at the place you are visiting, it might be a good way to sightsee while staying dry (at least if you stay inside the bus). Visit a local brewery or wine location, and learn about the local drink. Sorry to hear that, but a cable car ride and pub visit also sounds like a nice option! All great ideas! My rainy days are usually spent visiting museums, hanging out in cafes, or if I am feeling really lazy – bingewatching Netflix! I remember visiting Mallorca in Spain last year and doing these on an especially rainy day there. It’s great if you make the most of it :). Hey! We did #2 and #3 from the list last year in Bali. We just watched the rain while enjoyed our breakfast.